Bellezza is Beauty: Too Many Bracelets? Do you have a lot of bracelets? I think that most girls do! The problem is how to store them? Previously, I just had them hanging off a mug tree - not the nicest looking thing! I went into John Lewis yesterday when there clearance sale was and I saw this dish on sale for £5 - it's just a plain beige which is ok and it was the right sort of shape! 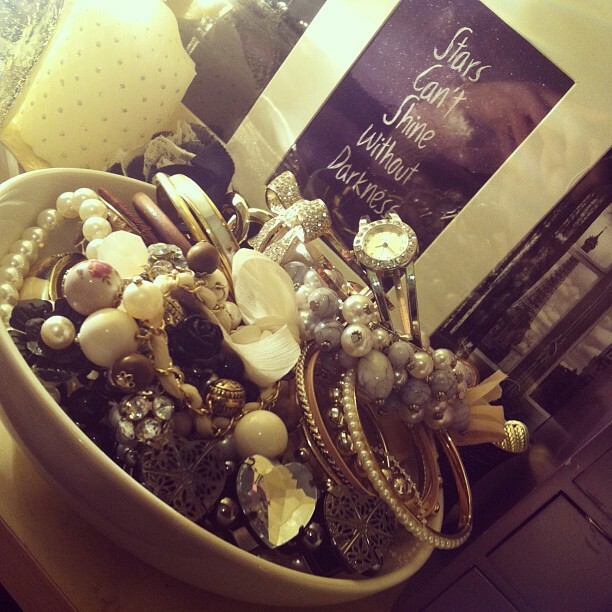 I've put all my bigger and most used bracelets in there and I think that it looks very pretty! I've also been able to fit quite a lot in! Also if anyone wishes to know the frame at the back of the bowl is just a plain 4 photo white frame from Wilkinson and I put in some post cards that I got from Paris (black and white ones). Also there is a quote that I saw on Tumblr 'Stars can't shine without darkness' which I thought was a very inspiration quote and so I printed it out in black and white on photo paper!